When patrons of Avila’s El Ranchito sit down to eat, they’re handed a menu bearing a picture of Margarita “Mamá” Avila. The matriarch of the Mexican food restaurant group is standing by stacks of plates. Her face beams. The photograph suggests that happiness surrounds the making and eating of food from recipes passed down through generations. Family lore says the beloved Mamá didn’t pose for the picture. It just sort of happened. It was a fleeting moment, captured nearly 50 years ago in the days following the November 1966 grand opening of the first Avila’s El Ranchito in Huntington Park. In an era before ubiquitous smartphone cameras and flooded Instagram accounts, it was a spontaneous action, since memorialized on all menus in the 13-restaurant restaurant group. On a recent afternoon, Maria Elena Avila, daughter of Mamá Avila, sat at a table inside the Westside Costa Mesa Avila’s restaurant, which she owns. She held a menu bearing the image of her mother from long ago. Mamá Avila lives in Corona del Mar with her husband of 70 years, Salvador. It’s said that the 91-year-old Mamá is a local celebrity. If the Avila’s restaurant group had a headquarters, it is her home on Point Sur Drive. With no central office to speak of, decisions are made in the house by family. “It sounds so basic, but it’s what has given us that staying power for 50 years,” Maria Elena said. Margarita, now in a wheelchair, remains ever the matriarch, particularly when it comes to her own kitchen. She directs what occurs there. Maria Elena looked again at her mother’s picture, remarking that the family couldn’t have orchestrated a better one if they tried. Maria Elena is thinking a lot about her mother these days and the rest of her family. This year marks the 50th anniversary of the restaurant group. 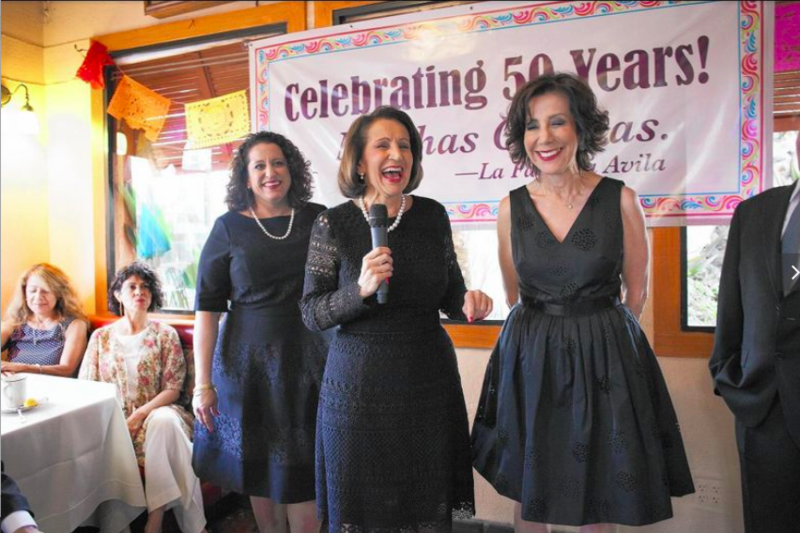 At the Costa Mesa restaurant on Thursday, the Avilas hosted a private party, starting what will become a summer-long celebration of the milestone at all 13 El Ranchitos. The first public party is at the Costa Mesa restaurant this weekend. Afterward, each location will have food and drink specials on a scheduled Thursday, as well as raffles and other giveaways. But on this Thursday, it was a time to reflect on family history over margaritas, wine, tacos, tortillas and mariachi. Employees wore 50th anniversary T-shirts and nametags with the year they started working for the company. Most of the people there were family friends and Latino community leaders. As the guests walked into the restaurant, they saw rows of Avila family photos, including one taken in April of Margarita and Salvador on their 70th wedding anniversary. The couple met in their native state of Guanajuato, Mexico. In 1958, they immigrated to the United States and in 1966 founded Avila’s El Ranchito in Huntington Park, a working-class suburb south of Los Angeles. Sergio Avila, one of Salvador and Margarita’s sons, owns three of the family restaurants: those in Corona del Mar and Huntington Beach and on the Balboa Peninsula. But he started as a dishwasher, he noted, alongside his Grandpa Poldo. He was 12. “Initially, everybody had to chip in,” Sergio said. He recalled the story of how Salvador came to be a restaurant owner. A distant relative came over to the Avila home one night with a business opportunity. He wanted to sell a restaurant. Salvador, with a $2,000 investment, agreed to take on the challenge. In effect, he became a restaurateur on a whim. The whole business was set up in a matter of weeks, guided by Mamá Avila’s time-honored family recipes. It started with five tables. “It’s just a fate of God,” Sergio said. “We fell into it. Margarita Avila, another of the elderly couple’s children, recalled that working in the family restaurant helped her overcome her youthful shyness. Still, she added, it was hard work. She would go to Avila’s after school, sometimes laboring while still wearing her school uniform. Elyse Avila Smith shared a different story. She opened an Avila’s in Seal Beach last August. As the third generation of Avilas in the family business, her first official job was at the Corona del Mar location as a busgirl and hostess. Smith used to cook with her grandma, but now after starting her own location, the two share another bond. On tough days after running the Seal Beach location, Smith knows that Mamá Avila understands. She’s been there too. Gaddi Vasquez recalled being at Avila’s El Ranchito’s 25th anniversary party. The former Orange County supervisor, former director of the Peace Corps and former U.S. ambassador to the United Nations Agencies for Food and Agriculture is a family friend. The Orange resident called the Avila’s restaurant group one of the most admired companies in Orange County. “They are amazing people who really respect all that is good about hard work – ethical people who have dreams and hope for their children,” Vasquez said. They are amazing people who really respect all that is good about hard work, ethical people who have dreams and hope for their children. While sitting on her restaurant patio, Maria Elena was approached by a Cub Scout. She recognized him instantly, though the young Scout has changed quite a bit. When Maria Elena first saw him, he was 5 days old, the son of a customer. She hasn’t forgotten holding him in her arms. Jesse Miranda, who has a Hispanic leadership center and teaches theology and ministry at Vanguard University in Costa Mesa, gave a blessing. “I know one thing: God has blessed El Ranchito and the parents,” Miranda said. Maria Elena later commented that it was shame her parents couldn’t be there that night. “They’re here in spirit,” she said. Previous Post Avila’s Guava Margarita at Avila’s El Ranchito, Our Drink of the Week!